1 Stir Hellmann's® or Best Foods® Sunflower Oil with a hint of Lemon Mayonnaise Dressing, vinegar and water in small bowl until blended and smooth; set aside. 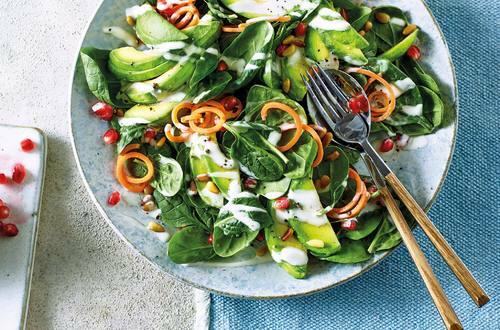 2 Arrange spinach and avocado on serving plates. Top with carrots, pomegranate seeds and pine nuts. Sprinkle with pepper and drizzle with dressing.